Roadside places to eat are a bit thin on the ground in the A13 corridor, an area just north of the Thames between London and Essex. For a hungry driver heading west towards the capital from the Essex stretch of the M25, or indeed heading out of town towards the M25 to go further afield, options for a quick bite or a stopover are limited. 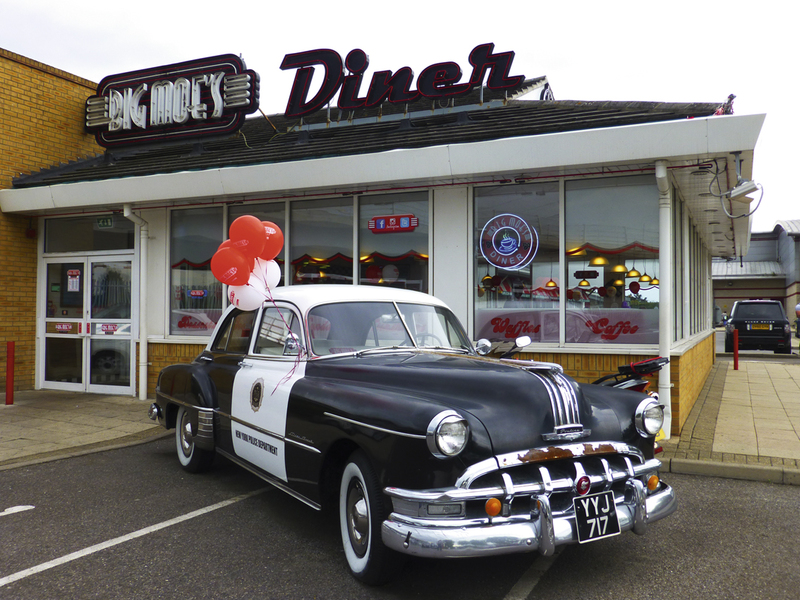 So Big Moe’s Diner, nestling within sight of the A13 at Barking, is an oasis worth noting. This jolly 1950s American-themed diner has big bright neon signs above the door, a classic New York police car, and a black and white Pontiac parked outside. Inside it is a visual feast of colour, with red leather booths, chequered flooring, ‘50s memorabilia, and a fabulous Wurlitzer jukebox. There is a family-friendly atmosphere and an extensive menu with everything from chunky home-made burgers to chocolate bar milkshakes. It takes pride in serving its customers with 100 per cent prime beef burgers made on site, freshly baked brioche buns sourced from a local bakery, and chips hand-cut from sacks of potatoes kept out the back. It boasts of making its own lemonade from fresh lemons, and if you order waffles, they will cook them in front of you. Prices aren’t cheap, but reasonable for the quality of food. A classic burger, served with chips and salad garnish, is £8.45. The ‘signature burger’ with added smoked chicken rashers, cheese and onion rings, is £9.95, with the option of doubling up the burger for an extra £2. The menu is very extensive, there is oodles of choice, and anyone with a sweet tooth will love the chocolate bar milk shakes whipped up from a choice of 16 scrummy treats, including Snickers, Crunchie and peanut M&Ms. These are £3.95 for a big glass. Just don’t think about the calories! We were there on a busy Saturday, when a corner of the diner was set up for a children’s party, but service was still slick and friendly. Good food and a friendly atmosphere make it certainly worth a return visit. ‹ Grand progress – or maybe not?